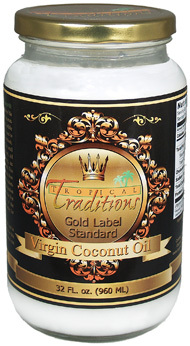 Tropical Traditions coconut oil is not like a regular oil that you might seen in store or in online.This Virgin Coconut Oil is a truly unrefined coconut oil. This coconut oil is made on Mt. Banahaw and surrounding areas from organic coconuts. Coconuts are used fresh (within 24-48 hours of harvest) from small family farms on Mt. Banahaw and other rural places in Quezon Province, the coconut capital of the Philippines. Only the highest quality coconuts are hand-picked from each harvest. The volcanic soil of Mt. Banahaw makes these organic coconuts some of the most nutritionally rich coconuts in the world! Testing done in independent laboratories on coconut oil antioxidants reveals higher levels of phenolic antioxidants than other coconut oils. The fresh coconut meat is shredded (wet milled), and then cold-pressed using the water from inside the coconuts to make coconut milk. The milk is then allowed to sit for about half a day, while the oil naturally separates from the heavier water. The oil is then filtered from the curds (coconut solids). No chemical or high-heat treatment is used, and this oil contains no trans fatty acids. We do NOT mass produce this oil. It is made by families who are coconut farmers using old-fashioned traditional methods that have been used in the Philippines for hundreds of years. Our coconut trees and family producers are certified organic according to strict USDA standards. The families who produce the oil are also trained according to GMP (Good Manufacturing Practice) standards and re-certified each year. This high-grade Virgin Coconut Oil has a long shelf life due to the high antioxidant properties. The Gold Label Standard is our highest standard for Virgin Coconut Oil. You can get any size of jar; I got 32 oz to review. This is totally pure coconut oil;It can easily freshen up your mind and body.You can use it for skin/hair care as well as can cook with it. Many people from all over the world use coconut oil instead of soybean/other cooking oil.It has low fat and calorie that help to prevent obesity.The sweet smell of the oil makes food more delicious. You probably need to try some of the recipes from their youtube channel.Subscribe now! Price- $19.95 for a 16 fl. oz. jar, 29.50 for a 32 fl. oz. jar, or $75 for a gallon. They are having a good sale- 60% off on your purchase!! !